All. Caciorgna L. - Prop. Caciorgna L.
All. Fisco M. - Prop. Caciorgna L.
All. Francini A. - Prop. Sozzi G.
All. Fosander M - Pr. Carichino R.
All. Fioravanti A - Pr. Lapi G.
All. Francini A - Pr. Guerci O. All. Forsander M - Pr. Carichino R.
All. 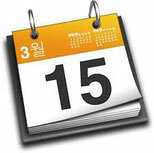 Rocchi D. - Pr. Carichino R.
All. Francini A - Pr. Silvani F.
All. Fioravanti A - Pr. 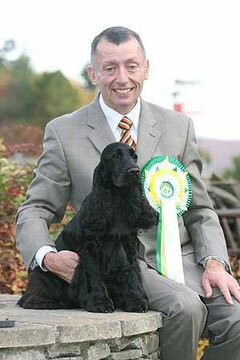 Fioravanti A.
I bred and showed Cocker Spaniels for 25 years making up 8 Champions, winning 82 CCs, 63 BOBs, 51 RCCs, BOB at Crufts, 11 x Gundog Groups, 3 x BIS & 4 x RBIS at All Breed Champ Shows. 5 times Cocker of the Year, twice Cocker Puppy of the Year. 3rd Top Gundog 2007, 2nd Top Gundog 2008, Top Gundog 2009 and currently hold the record for 'Top Winning Solid Colour Cocker Spaniel of All Time' with Sh Ch Dillonpark Ambrogina. 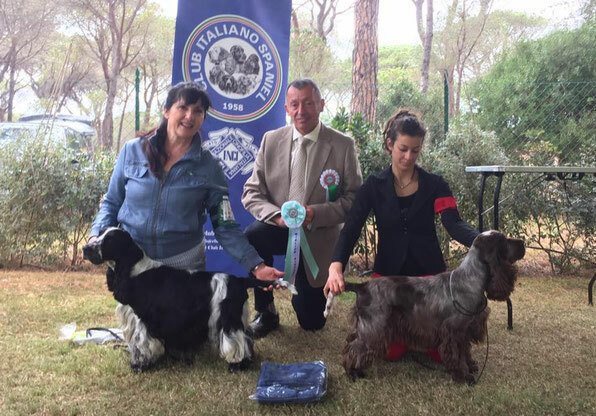 My last UK Champion, Sh Ch Dillonpark Peroni, is now an Australian Champion with Ann O'Keefe's Glenayden kennel and made history by winning BIS at The Australian Cocker National, the first black to win this award and also the first time BIS was awarded to an import. 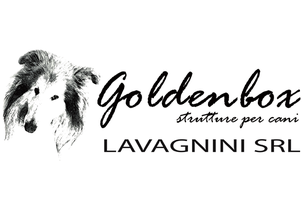 I have judged Cocker Spaniels in the UK on numerous occasions including The Cocker Spaniel Club 2015 and I will be judging Cocker Spaniels at Crufts 2019. 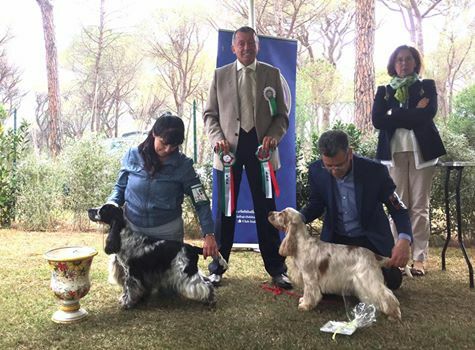 I have also judged Cocker Spaniels in Sweden, Finland, France, Spain, Ireland, Italy, Holland, Russia and Australia.